Appendicitis - body, causes, What Is Appendicitis?, Who Gets Appendicitis? 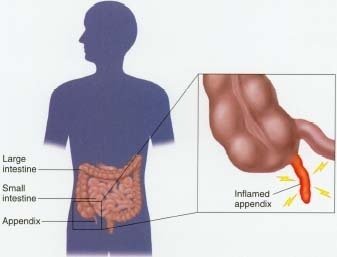 Appendicitis (ap-pen-di-SY-tis) is the inflammation of the appendix (ap-PEN-dix), which is a small organ that branches off the large intestine. The inflammation usually begins abruptly, causes a characteristic rightsided abdominal pain, and may lead to rupture or bursting of the appendix and to severe illness. Acute * appendicitis occurs when the vermiform (VER-mi-form) appendix becomes infected with bacteria. Vermiform means shaped like a worm. The appendix is a narrow, finger-shaped tube, usually 3 to 6 inches long, that branches off the large intestine into the lower right side of the abdomen. Inflammation is the body's response to this infection. Once the appendix becomes inflamed, it must be removed so that it does not break, or rupture, and spread the infection to the rest of the abdomen, a condition known as peritonitis * . The appendix has no known function, and its removal has no adverse effect on the body. Each year, appendicitis affects 1 in 500 people. Anyone can develop appendicitis, but it is most common in young people between 15 and 24 years old, and it affects boys more often than girls. Appendicitis is not preventable. 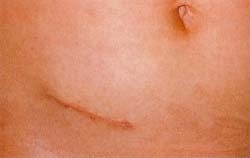 Surgical removal of the appendix, appendectomy (ap-pen-DEK-to-mee), is a common reason for abdominal surgery in children. People can die from appendicitis if it is left untreated, but this is rare. * acute means rapid in onset, and short-lasting. Conditions that continue for a long period of time are called "chronic." * peritonitis (per-i-to-NI-tis) is inflammation of the peritoneum (per-i-to-NE-um), which is the membrane that lines the abdominal cavity. What Happens to People with Appendicitis? David's appendicitis happened suddenly, when he awoke at 1:00 am with a terrible bellyache. He blamed it on the chips and ice cream he had eaten after dinner and tried to go back to sleep. By 7:00 am, his bellyache was worse, he was not hungry, and he felt very hot. He told his parents about the intense pain in his right side, and they took him to see the doctor immediately. A series of events followed rapidly. Appendicitis occurs when the appendix, located at the large intestine, becomes infected with bacteria and inflamed. This is an appendectomy scar on the lower right side of the abdomen one week after surgery. New surgical techniques can make scars less noticeable. Dr. P. Marazzi/Science Photo Library. Photo Researchers, Inc. The doctor asked David lots of questions about the pain: Was it constant? Did the right side hurt the most? Was the pain worse when he moved, coughed, or took a deep breath? Was he nauseated? He said yes to all of them. David's abdomen felt hard when the doctor touched it, and when the doctor pushed on the right lower part, David yelled. A nurse took David's temperature and a blood sample. David had been at the hospital for several hours. The nurses kept checking on him, asking him about the pain, and pushing on his abdomen. The pain did not go away and started to get worse. David's doctor decided that David should be taken to the operating room right away to have an appendectomy (surgical removal of the appendix). To prepare David for the surgery, the doctor explained about general anesthesia * and showed David where he would receive a small cut in the abdomen through which the surgeon would remove the diseased appendix. The doctor and nurses kept reassuring David and his parents that he would be fine as they do this kind of surgery all the time. David awoke in the hospital recovery room, groggy, tired, and a little sore. His appendix, which had not yet ruptured, had been removed at 8:00 am. David went home from the hospital, minus his appendix, but otherwise healthy. He was still aware of a slight soreness at the site of his appendectomy scar. Within a couple of weeks, David was back to doing just about everything he had done before his appendicitis. His appendectomy surgery had been a complete success. * general anesthesia (an-es-THE-zha) means using drugs or inhaled gases to create a state of unconsciousness and muscle relaxation throughout the body I block pain during surgery. Local anesthesia blocks or numbs pail in one part of the body while patients remain awake. The U.S. National Digestive Diseases Information Clearinghouse posts a fact sheet about appendicitis at its website.